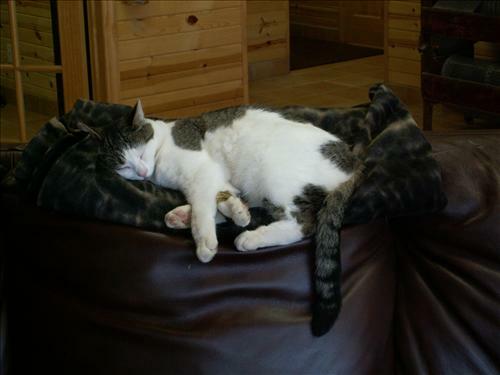 Please call Tammy Knaus on the barn cell at (608) 577-4867 to set up a time to take a tour of our boarding facility and see the place in person. We will have two stalls opening up January 1 st, 2019. We normally have a waiting list to get in, call 608 577 4867 for more info. BEE does NOT offer rough board. 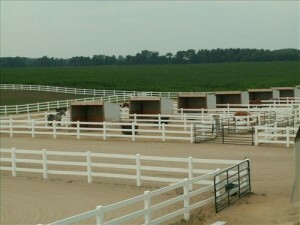 All horses are turned out daily and spend nights in their own stall. 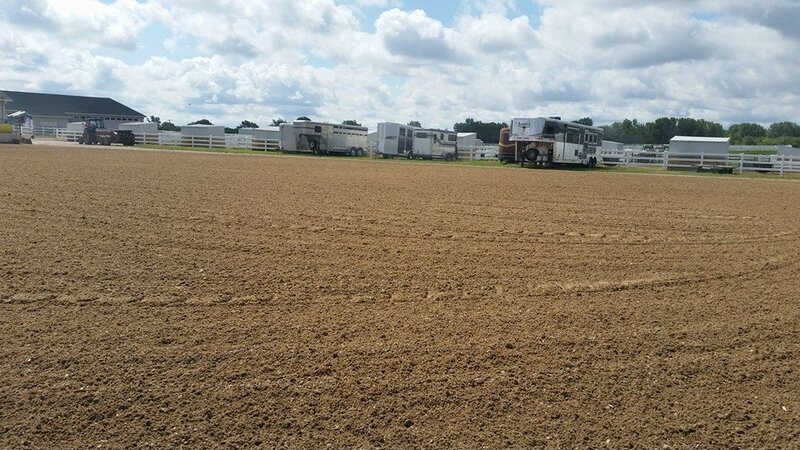 This allows us to more closely monitor each individual horse and be sure they are getting the food, supplements and care they need. BEE does not own or provide lesson horses for the public. 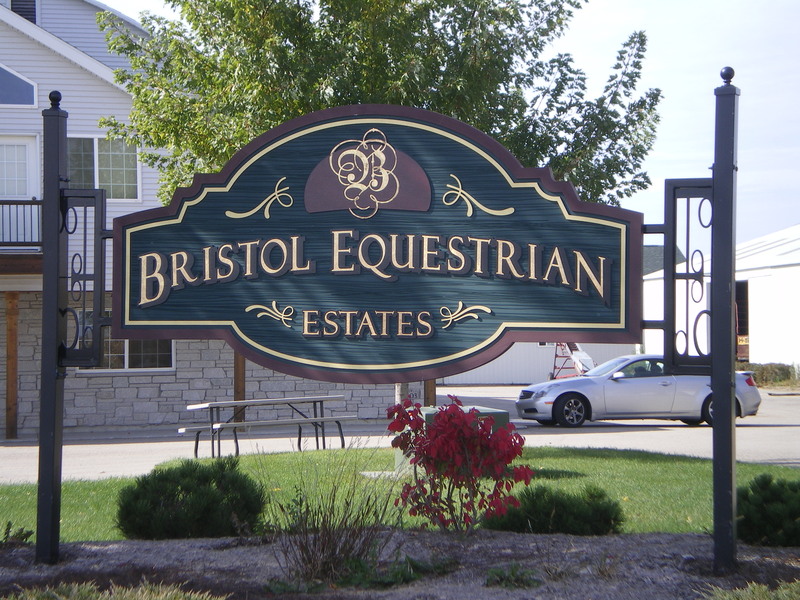 If you board here, there are several different trainers who offer lessons for you and your horse. 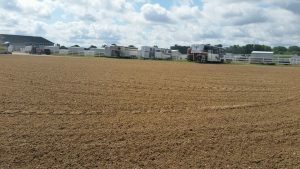 Also check the Horses for Lease section of this website, sometimes our current boarders are looking to lease or half-lease a horse. 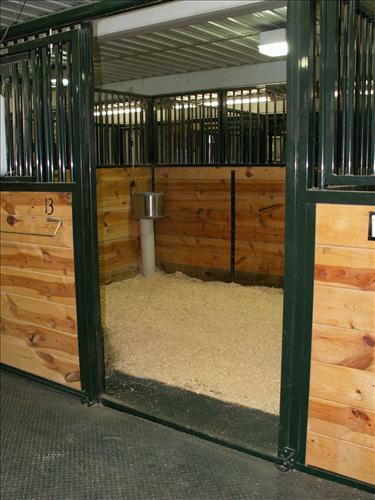 Stalls Our 12′ x 12′ fully matted stalls are thoroughly cleaned SEVEN days a week, 365 days a year. BEE does not avoid stall cleaning just because it is a holiday. We use quality, clean pine shavings and finely chopped straw for bedding, on top of the matted floors. The grain boxes and the automatic waterers are scrubbed once a week; waterers are also dumped out daily. No grungy buckets here! Daily Pasture Turnout Weather providing, horses get 8-10 hours of turnout on grass pastures. 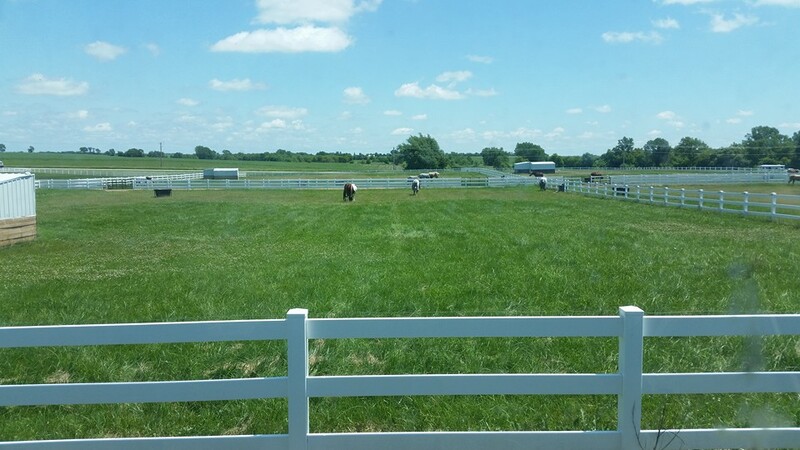 Our pasture group sizes are 4-6 horses and we always separate the mares from the geldings. 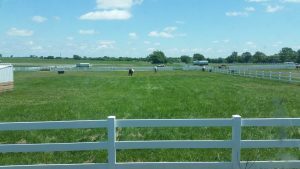 Safe white vinyl fencing with smooth electric wire around the inside of each pasture. 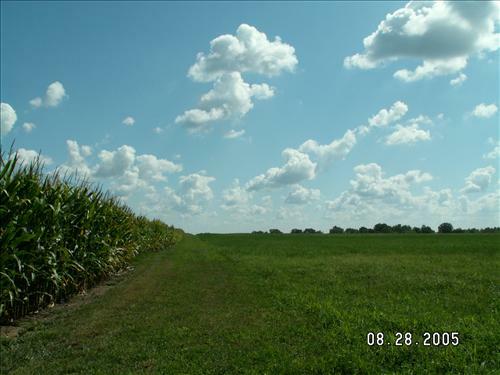 Each pasture has at least one shed for shelter, hay feeders and a heated automatic waterer for year-round drinking. 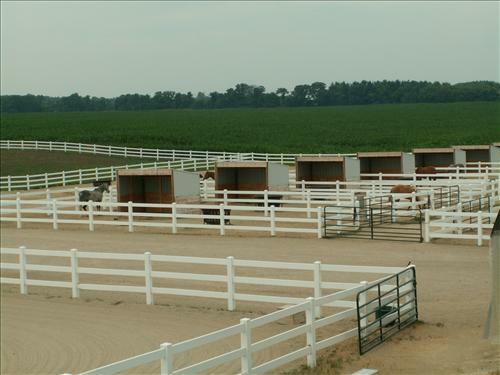 Private Dry Lot Turnout Sixteen individual dry lots each have their own hayfeeder, heated automatic waterer, and shelter. 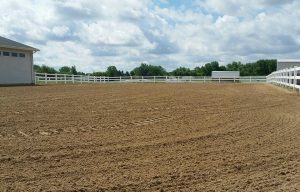 Private/semi-private (shared with one other horse) dry lot turnout is available for an extra fee per month. 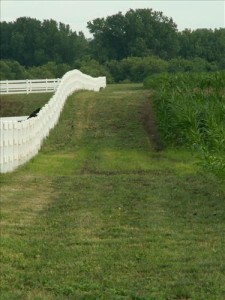 Perfect for special needs horses who can not be on grass, for injury rehabilitation, for show horses or for stallions. 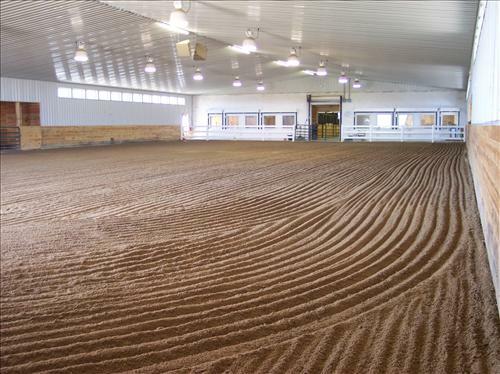 Indoor Riding Arena Our insulated 85′ x 140′ indoor arena is dragged and groomed 7 days a week! We have a Kiser drag that grooms the footing to perfection. The fluffy top layer of sand sits on a solid, level base that is perfect for several different riding disciplines. Our boarders ride eventers, hunters, jumpers, western pleasure, saddleseat, dressage and even do some driving. 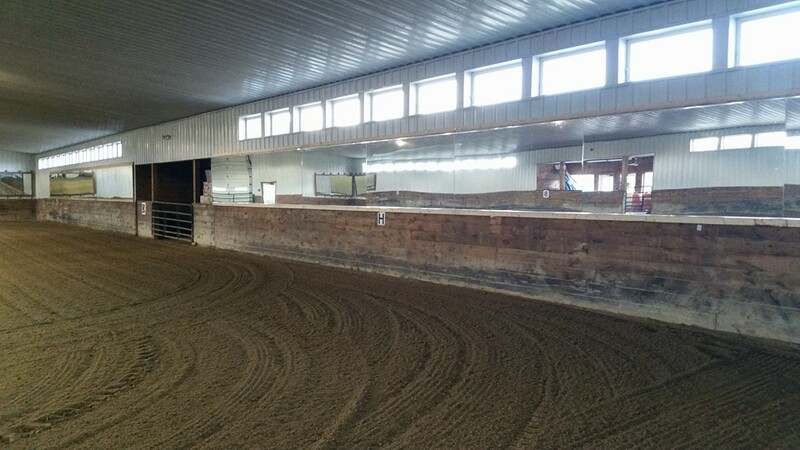 We have bright LED lights, plus windows and lots of mirrors for checking your and your horse’s position & movement. More views of our indoor arena. The west wall is completely covered by large mirrors. Our arena is very well insulated and thus stays very comfortable. In Wisconsin’s sub-zero winter temps, our boarders usually ride in just a shirt and a vest. During hot summer days, it is so cool that it feels like the indoor arena is air conditioned. 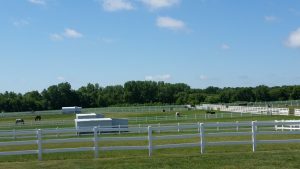 Main Outdoor Riding Arena sits alongside our indoor arena and near the first pasture. It is fenced and the sand mix footing is dragged and groomed seven days week weather providing (until the ground is frozen too hard to ride outside.) 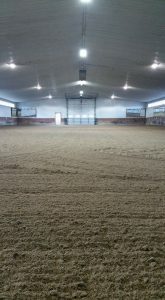 Several jump standards and poles are available for use in this arena. 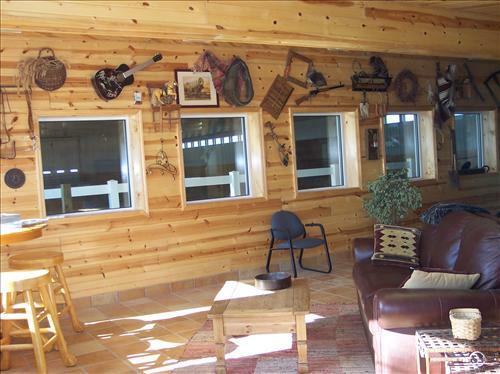 Heated & Air Conditioned Lounge Our lounge and viewing area is comfortable year-round, with windows to watch the action in the indoor arena. Sit back and relax in our equine themed area. Lounge Kitchenette Our lounge includes a kitchen area complete with microwave and sink. Great for snacking or meals while you are at the barn. Plus many of the local pizza & sub shops deliver here quite regularly! Relax For those non-horsey guests and family members, our lounge has a TV and Wi-Fi. Perfect so you don’t miss the Badgers or Packers game or for research! 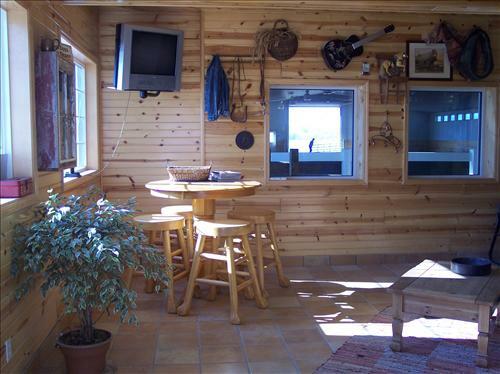 The table & stools work great for kids doing homework, plus you can always see what is going on in the indoor riding arena. Mowed trails between pastures and crops. 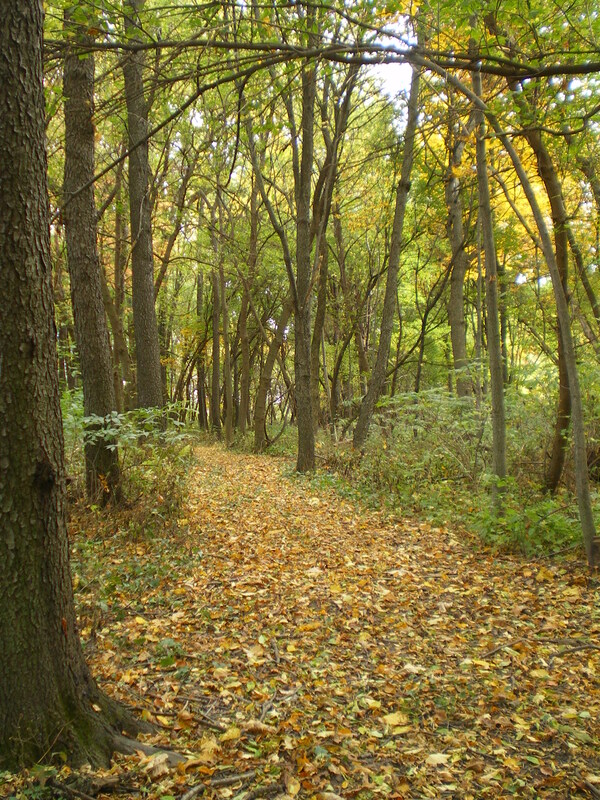 Trails Since we are located on almost 300 acres, we have plenty of room out on the trails. Our mowed trails are easy to follow; flowing over gently rolling farmland, around the pasture fencelines (photo), and also between our crop fields. 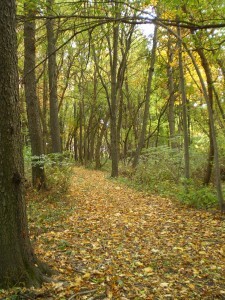 Some of our trails wind through a section of woods. 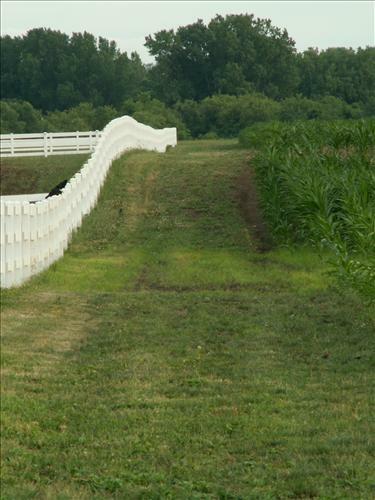 BEE’s trails are wide enough for 2-4 people to ride side-by-side and also convenient for driving a carriage or cart. No need for riding on roadsides here! 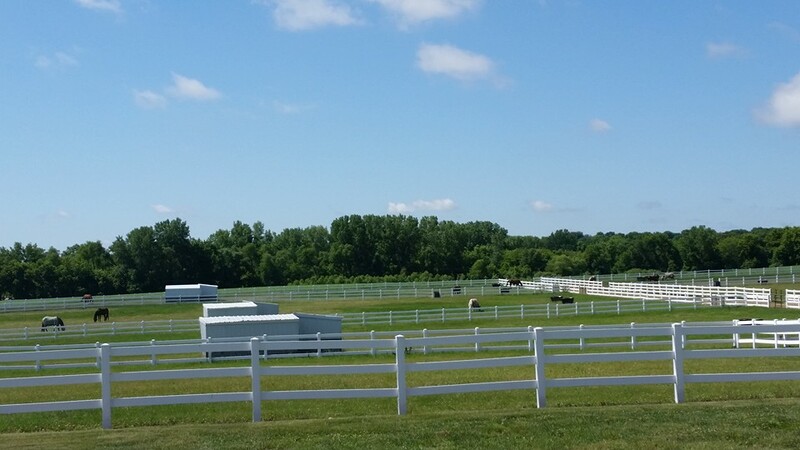 Imagine you and your horse riding our trails on a day like this! 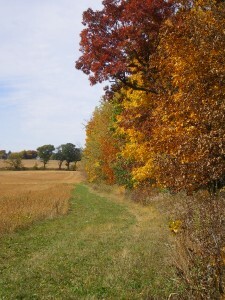 The trails through our woods are wide enough for a small tractor to go through, have very clear boundaries, and wind lazily through the trees. Cranes taking a stroll in one of our fields. 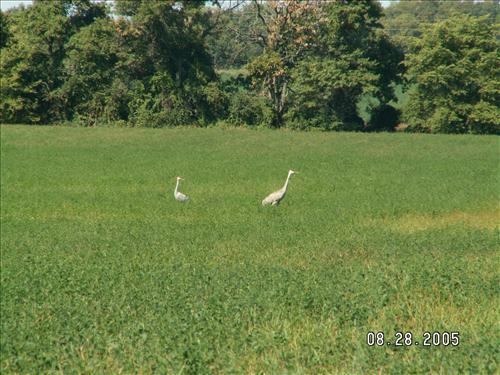 Wildlife If you ride quietly and slowly, you may just glimpse various songbirds, rabbits, cranes, whitetail deer, fox, raccoon, or other native wildlife along our trails. 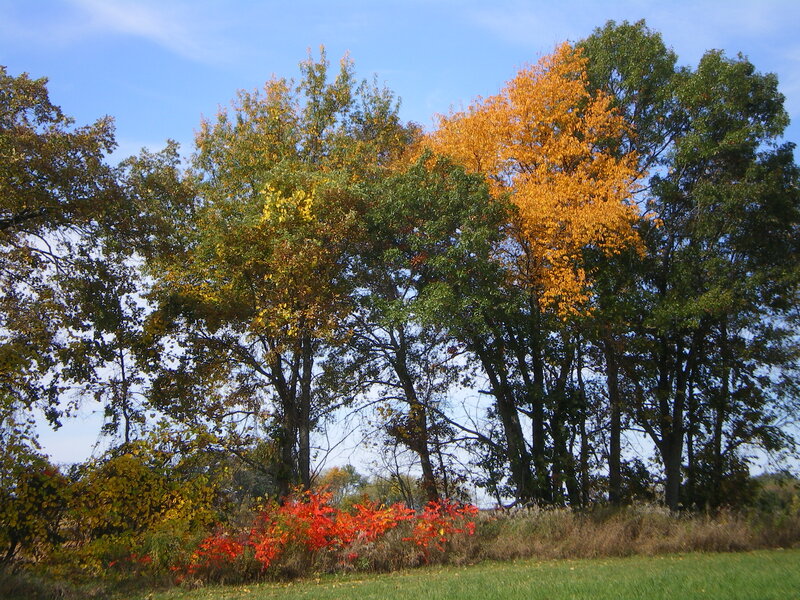 Beautiful fall colors along our trails. More fall colors along the trail.